Urban women played a significant role in the struggle against Apartheid by entering into the labour force and taking jobs as both domestic workers and factory workers. These jobs helped women to make the connections necessary to form support for trade unions and ultimately anti-apartheid political organisations. As a result, women led a series of successful anti-apartheid campaigns that significantly impacted the struggle against apartheid. An anonymous member of the African National Congress Women’s League said, ‘I am a woman, I am a worker, and I am Black. Therefore I must fight for my freedom on three fronts’ (Magubane, 2010). Before women began taking jobs in factories, and ultimately playing a key role in the anti-apartheid resistance movement, society in South Africa was largely patriarchal and women struggled against a society that viewed women as subordinate to men. Women could not own property, claim inheritance, or have guardianship of their children (SAHO). Furthermore, legislation, such as pass laws that extended to women, made life in urban areas even more difficult for women as they often found it challenging to find employment. The apartheid government viewed women as a sign of ‘growing urbanisation’ (Lee, 2009) of Africans and quickly reacted to control the flood of African women into the cities. Women were needed in urban areas, especially during and after World War II to fill the positions in the factories. With the flood of women entering the cities, the apartheid government felt threatened as Black and Coloured South Africans would now be able to reproduce and build roots in the cities due to a growing population of both men and women. Legislation, such as the 1952 Native (Urban Areas) Act, bound women to the Urban Areas Act in the same way it did men this making it much more difficult for women to find work. Despite the societal and legal forces that aimed to oppress women, the women of South African cities began to overcome their struggles by taking jobs in factories, forming trade unions and building relationships with other women that would assist them in their struggle for equal rights. Many women worked labour-intensive jobs that demanded long hours with little pay however, these women continued to work as they knew it was necessary for themselves and their families to survive. Despite discriminatory laws, women of South Africa shifted their societal roles to become matriarchs and providers which led them to become an integral part of the anti-apartheid movement both socially and politically. During the reign of the apartheid government, life became increasingly challenging for African families, who were subjected to the Afrikaner government’s ‘separate development’ program built on the theory that Africans would be better off in separate areas of the country from white South Africans. This concept was simply a mask for the apartheid government to oppress Black and Coloured South Africans on the basis of race. With this program, and the legislation that accompanied it, Black and Coloured families found it increasingly difficult to support themselves as job opportunities diminished. Before women began taking positions in factories, many women worked in the cities as domestic workers where they were employed by white families to clean, cook, and watch children. In Sheila Rule’s 27 December 1985 special in the New York Times, Rule points out that domestic workers in South Africa faced far greater challenges than domestic workers in other parts of the world due to the oppressive apartheid laws. As part of her piece, Rule conducted an interview with Maude DeBruin, a 68-year old domestic worker who has been working for 47 years for white families. According to the article, DeBruin made approximately 100 rands per month (at the time, it was equivalent to approximately $38 USD) plus food and housing; however, some workers were paid just 40 rands per month (Rule, 1985). While DeBruin’s employer allows her to attend church services, she says she knows other workers whose employers have told them to ‘tell the minister to give you a job’ when they request to attend church (Rule, 1985). Rule also states that many employers fired workers for health issues and view these women as ‘necessary fixtures whose spirits are entombed in subservience’ (Rule, 1985). According to Leah Tutu, the director (at the time) of the Domestic Workers and Employers Project and wife of Desmond Tutu, ‘It is truly a master-servant relationship. It is rare for a white not to have a domestic worker, but the whites generally treat them as children who don’t really know anything. They pay them what they would like to pay them”¦the domestic workers are at their beck and call 24 hours a day’ (Rule, 1985). In her interview, DeBruin also states that she has a ‘luxurious’ living space which has cement walls, two small rooms in the backyard of a large home and a small television. While the position of a domestic worker was highly undesirable, many women living in apartheid South Africa were presented with no other choice. Due to the oppressive legislation that crippled the economic opportunities for Black and Coloured South Africans, as well as the lack of employment and educational opportunities afforded to them, many women were forced to take these positions in order to provide for themselves, their husbands, and their families. These positions required long hours which allowed women minimal time with their families. Any work was in such high demand that at the moment a domestic worker was fired, another would be waiting outside of the house willing to accept less payment than the one just let go. As women began to take jobs in factories, some continued working as domestic workers. While the positions in factories women took post-World War II were equally challenging, these opportunities afforded the women of South Africa far more than economic benefits. Women made tremendous sacrifices and worked long, tiring hours to provide for their families. In her book, Married to the Struggle, ‘Nanna’ Abrahams recalls her early life; Abrahams was educated and was ready to begin high school when she was forced to quit school and look for employment to help support her family. At age 14, Abrahams began working in a fruit-canning factory in which women worked long hours on their feet with no breaks and no benefits. These women were provided with no protective gear and were forced to walk long distances to their jobs as there was no transportation provided. Nanna Abrahams’ story is similar to that of many Black, Indian, and Coloured South African women who changed their roles to support their families. Women’s anti-apartheid political activism began with their transition from being viewed as inferior to matriarchs, workers, and in many cases, sole-providers who ultimately played a crucial role in the anti-apartheid movement. During the years of apartheid, women made several political, economic and social transitions that would forever alter their place in society. In her book, African Women and apartheid, Rebekah Lee notes, ‘Among these were African women’s increasing prominence in civil society, the rise of matriarchal households, and the marginalisation of men in township domestic economies’ (Lee, 2009). As many men struggled to provide for their wives and families, under the weight of apartheid laws, women began to seek employment to ensure their families survived and began working predominantly in factories, usually under a white, male supervisor. Some women also continued finding employment as domestic workers in urban areas. Both domestic work and factory work were very challenging. Despite the poor working conditions, women persevered and did what was necessary to earn a living. In her co-authored autobiography, My Sprit is Not Banned, Frances Baard recalls the poor working conditions in the factories such as: the lack of proper equipment and tools and the lack of transportation available for women to get to-and-from work. In most cases, the women were not given protective clothing and the juice, from the fruit they were canning, ruined their personal clothing. Additionally, women worked into the late hours of the night as leaving the fruit overnight could cause it to spoil. Baard recalls seeing her children rarely as they were asleep when she left for work early in the morning and were asleep by the time she returned home late in the evening (Baard, 1986). As more and more women began to fill factory positions, large groups of women were united and collectively fostered feelings against oppression created by the apartheid government and traditional South African society. These poor working conditions, according to historian Iris Berger, led to the formation of trade unions and later to the mass-mobilisation of women in South Africa. In protesting their poor working conditions, working women formed bonds and connections that they would not have otherwise made before (Berger, 1992). By forming trade unions, women were also able to make a significant accomplishment in their work environments by fighting for Black and Coloured women to have the ability to be promoted to the forewomen position in the factories, a position previously only given to white males or white females. Women not only saw their burgeoning presence in factories as part of the advancement for themselves but viewed it as part of the advancement of their families, who greatly suffered from apartheid laws and the worsening economic situations of African families, and ultimately for the entire population of Black South Africans. While the success of the women’s movement in the struggle against apartheid can largely be credited to their transition into the labour force (and the resulting transition into political activism), the role of women as political activists, according to SAHO’s “Women Play a Leading Role,” dates back as early as 1913 when African women in urban areas launched protests against monthly permit renewals, which ultimately resulted in the law being repealed. Also, in 1918, the Bantu Women’s League of South Africa organised anti-pass campaigns, further involving women in political matters. However, the change in women’s labour roles, especially after World War II, was a main catalyst in their involvement in political movements. As women continued to work in industrial settings, they began to form trade unions, which laid the foundation for women’s political organisations. Women’s changing economic roles resulted in their participation in the political struggle against apartheid laws. Women began to unite and began to organise demonstrations in masses to protest discriminatory and oppressive legislation. In the post-World War II era, women saw great success and made great strides in organising demonstrations as part of the anti-apartheid movement. On 17 April 1954, the African National Congress Women’s League (ANCWL) published the Women’s Charter, a document that outlines the plight of urban women and their struggles for equality, on the basis of both gender and race. Some of its main points discussed: the poverty of families (and women) due to favorable treatment of the white minority, the inferior status of women as subordinates of their husbands, women as the sole earners of households, legal obstacles for the advancement of women, and the lack of opportunities for women’s education (ANCWL, 1954). In its preamble, the women of the ANCWL stated that its goal is to work towards the repeal of any legislation that is discriminatory towards women and that creates any social disadvantages for women. Raids, arrests, loss of pay, long hours at the pass office, weeks in cells awaiting trial, forced farm labour – this is what the pass laws have brought to African men. Punishment and misery, not for a crime, but for the lack of a pass. We African women know too well the effect of this law upon our homes, upon our children. We who are not African women know how our sisters suffer (Joseph, 1986). The detention and oppression of Black and Coloured men in South Africa had a devastating effect on family life as women were forced to compensate for the absence of income resulting from the their husband’s inability to find employment or their husbands not being present as they were unjustly detained under apartheid laws. Women continued to organise highly publicised, mass-demonstrations in order to voice their opinions and concerns. One of the most prominent examples of women organising took place on 9 August 1956, an anti-pass laws campaign which was organised by the Federation of South African Women, also known as the FEDSAW (SAHO). The successful demonstration boasted a turnout of nearly 20,000 women who protested outside of the Pretoria Union Building and yielded over 100,000 signatures on an anti-pass laws petition. The campaign was led by Helen Joseph, an anti-apartheid activist who worked tirelessly for the advancement of women in South Africa, along with seven other women. In her autobiography, Side by Side, Joseph describes the demonstration as a day she ‘shall never forget’ (Joseph) and recalls knowing that she and those protesting represented the women of South Africa, as a whole, and realised that the women of South Africa were watching as they stood up for equality. Movements such as this gave a voice to the women of South Africa and added another force in the anti-apartheid movement which joined with the men who were subjected to the governments laws. Urban women continued to organise in masses with public demonstrations against the apartheid government after the 1956 march. In 1962, on what is now known as “Africa Day,” the women of South Africa organised in support of the liberation of several African countries and protested in an effort to make South Africa the next to receive its freedom from oppressive white governments. 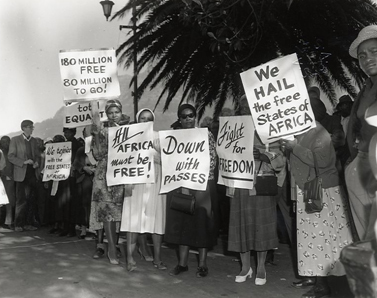 In the image above, titled “Women on Africa Day 1962,” several women stand in protest of the apartheid government’s unwillingness to go along with the emergence of indepednent states being formed all across the African continent. The image especially shows a successful integration of women into the anti-apartheid movement as a whole and supports the theory that women not only fought for themselves but for Black and Coloured South Africans as a whole as the issues of men also greatly impacted women and their families as well. The road to freedom for the women of South Africa was long and filled with struggle, poverty, and tireless work to both support their families and organise political demonstrations to fight for the freedom of Black, Indian, and Coloured South Africans. Urban women made the remarkable transition from working as domestic workers for little pay and little to no benefits, to working in factories which allowed them to form trade unions and to ultimately make the connections necessary to form a highly successful women’s anti-apartheid movement. Without making the transition from mothers and wives, to domestic workers, and to factory workers and unionists, women may not have been able to contribute nearly as much as they did to the anti-apartheid movement. The numerous women who sacrificed their personal lives and family lives to fight for change in South Africa are nothing short of incredible; these selfless women worked difficult jobs, worked for long hours with little pay, and worked tirelessly to organise demonstrations, rallies, protests, and petitions on behalf of the many South African men and women who were oppressed under the apartheid laws. The opening quote, which says, “I am a woman, I am a worker, and I am Black. Therefore I must fight for my freedom on three fronts” presented a challenge to South African women in the struggle for freedom. Despite the difficulties they faced, the women of South Africa rose to the occasion and fought for their freedom and made a tremendous impact on the anti-apartheid movement.